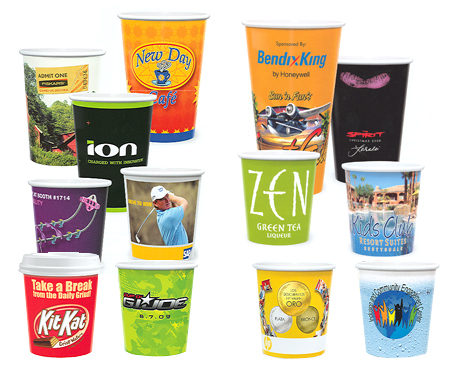 These Full Color Custom Paper Cups promote your image with incredible detail and clarity. Your one to four-color design is printed on White Paper Cups. Our Hot Cups are poly-coated on one side and are perfect for holding hot drinks. The Cold Cups are poly-coated on both sides to keep cold drinks refreshingly cool. Both Custom Cups are available in 12, 16, 17, 22, and 32-ounce sizes. The minimum order is 250 pieces for our Full Color Custom Hot Cups. For our Full Color Custom Cold Cups, the minimum order is 250 cups. Production time is about 10 business days. Lids and Straws are also available to complement your Cups. Our thermo-formed Lids are specially designed to nicely match any design you print.